Creating a niche market for Activity Patches such as Wing Foot, Academic Activity Patches, Cheer Leading Activity Patches, Drama Activity Patches, Field Games Activity Patches, High Jump Activity Patches and many more items at its best, with utmost quality. We offer to our clients Activity Patches. 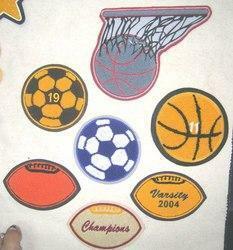 These patches are containing symbols which recognize various activities like sports etc. These are available in variety of colors and designs and are also offered as per the customers requirements and specifications. We are a renowned organization, which is engaged in offering Patches to our clients. The offered range of rugby activity patches is available in customized colors, designs, shapes and sizes in accordance with the diverse requirements of respectable clients. 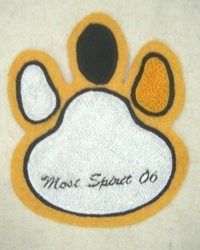 Along with this, the offered range of rugby activity patches is designed utilizing premium grade fabrics and modern techniques in tandem with the highest quality norms and standards. In order to cater to the diverse requirements of honorable clients, we are leading Music Patches manufacturer in India. The offered range of cheer leading activity patches is made utilizing high grade fabrics and highly advanced technology in strict compliance with the international quality standards. Along with this, the offered range of cheer leading activity patches is checked on different characteristics so as to ensure its adherence with the industry laid norms and standards. We are a leading manufacturer of huge variety of Field Games Activity Patches. 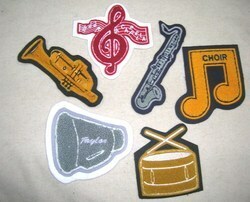 These patches represents different kinds of field games like football, volley ball, basket ball etc. These are also offered in numerous colors and sizes dependent upon the customers requirements. Keeping in sync with time, we are Tennis Activity Patches manufacturer in India. 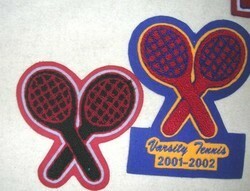 We cater these Tennis Activity Sport Patches to our respectable clients. The offered range of tennis activity patches is made utilizing high grade raw material and innovative techniques in strict compliance with the international quality norms and standards. Moreover, the offered range of tennis activity patches is known for representing teams, houses and various other information related to the sports and the player. Owing to the immense experience and a competent team of experts, we are able to offer Wing Foot Activity Patch to respectable clients. These wing foot activity patches offered by us are made utilizing high grade fabrics, which is sourced from trustworthy vendors of the market. 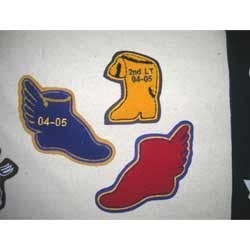 In addition to this, the offered range of wing foot activity patches possesses symbols that identifies numerous purposes like sports. 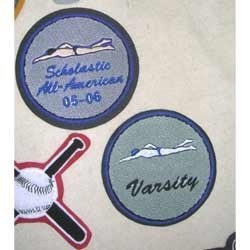 We have gained immense expertise in delivering Swimming Activity Patches to our clients. The offered range of swimming activity patches is available in various designs, shapes, colors and sizes with respect to the assorted demands of esteemed clients. Along with this, the offered range of swimming activity patches is suitably checked on number of characteristics to ensure its conformation with the benchmarks of quality.